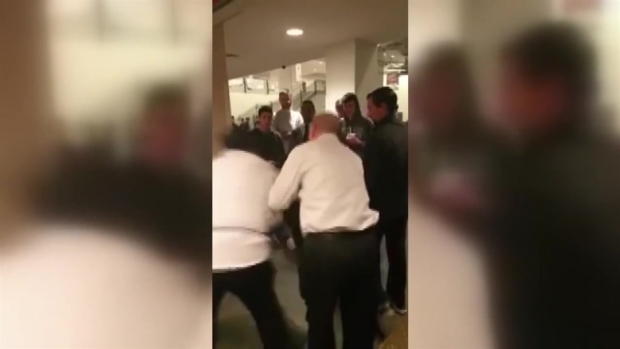 A UConn student was arrested at an on-campus dining hall on Sunday night and video of the wild exchange is generating some widespread attention. A report from UConn police says 19-year-old Luke Gatti, of Bayville, New York, refused to leave Union Street Market just before 10 p.m. on Sunday when he was denied service because he had been drinking in the market. 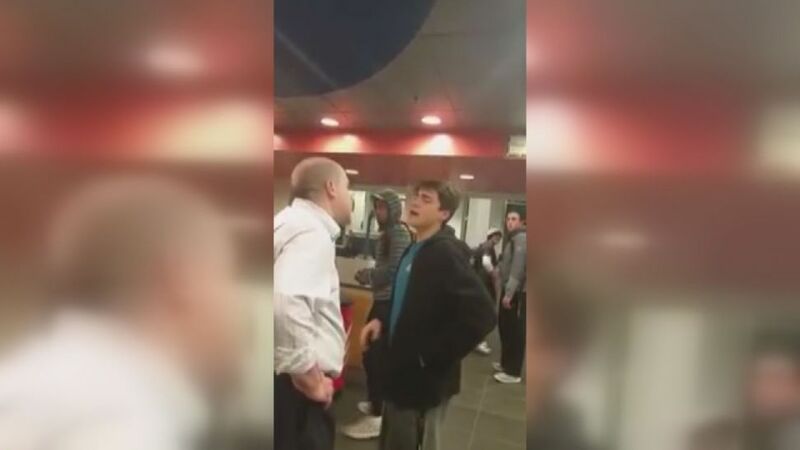 A nine-minute expletive-laden video posted on YouTube on Monday appears to show Gatti confronting the market manager because he wanted bacon-jalapeno mac and cheese, then shoving the man several times as apparent students tried to intervene. It goes on to show a staff member at the market eventually wrestle Gatti to the ground and detain him and police arrived. "Just give me my bacon mac and cheese and I'll leave. I don't see the issue," Gatti said in the video. "You can't bring a beer into a public dining hall," the manager told him several times. Police responded to the market at 9:59 p.m. after receiving a 911 call from someone who said the student refused to leave and the disturbance had turned physical, according to the police report. Gatti was charged with second-degree breach of peace and first-degree criminal trespass. He is due in court on Oct. 13. NBC Connecticut has reached out to Gatti, but he has not responded as of Tuesday afternoon. It’s not clear if he has an attorney. We also reached out to UConn, which issued a brief statement, saying federal student privacy provisions prevent the university from discussing potential discipline cases involving students. While UConn declined to discuss Gatti's case, university officials said any students found to violate the school's code of conduct could face anywhere from probation to expulsion. "Generally speaking, any UConn student found to have violated the provisions of the Student Code may face penalties imposed by the Division of Student Affairs that range from probation to expulsion," the e-mailed statement says. The university has not said whether school officials will punish Gatti. However a few UConn students spoke to NBC Connecticut about the incident. "I think the kid was in a state where he had absolutely no idea what he was doing, but, regardless, that was so inappropriate," Sarah Polcaro, a UConn sophomore, said. "He should not have been in that situation." Another UConn sophomore, Olivia Stenger, said, "I just feel bad for the staff. And I also feel bad for the kid 'cuz I think if he had friends there they should have held him back more." Another student who was behind Gatti in line thought he was there by himself, stating "he had a beer in his hand, you know?" Social media experts are chiming in on the impact the video of the UConn mac-and-cheese rant has on the reputation of the person who was recorded. According to court records from Massachusetts, Gatti was arrested twice in 2014, when he was a student at the University of Massachusetts and before enrolling at UConn. He was charged with disorderly conduct in one case and disorderly conduct and assault and battery on a police officer in the other. No information was immediately available on the outcome of either case.